The UK has a very high level of income inequality compared to other developed countries. Original, gross and disposable income by quintile group, Office for National Statistics, 2018. Households are ranked by their equivalised disposable incomes, using the modified OECD scale. The graph below shows how income is shared amongst households in 2016. The poorest fifth of society have only 8% of the total income, whereas the top fifth have 40%. 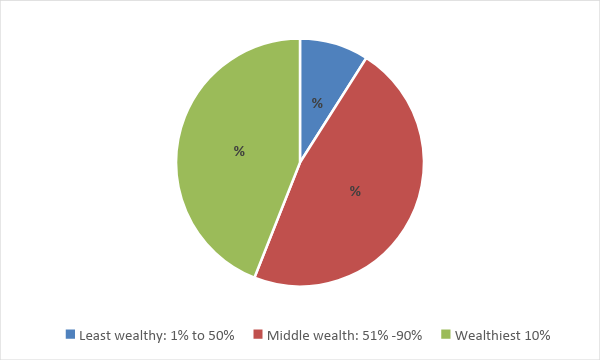 Percentage of total wealth in Great Britain, Wealth and Assets Survey, July 2014 to June 2016, Office for National Statistics. Wealth is also unevenly spread across Great Britain. The South East is the wealthiest of all regions with median household total wealth of £380,600, over twice the amount of wealth in households in the North West (£163,000). Median household total wealth by regions, Office for National Statistics. 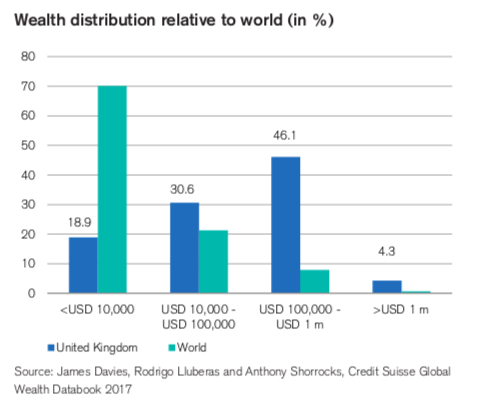 The UK's wealth distribution is roughly average compared to the other OECD countries. The UK has a wealth GINI coefficient of 73.2% compared to an OECD average of 72.8%. Compared to other developed countries the UK has a very unequal distribution of income. According to 2013 data* from 19 OECD member states in the Luxembourg Income Study data set, the UK is the fifth most unequal, and fourth most unequal in Europe. *LIS holds more recent single-country data for some countries listed in the graph above, however, 2013 is the most recent year from which the largest number of OECD-country data can be drawn. What has happened to the income of retired households in the UK over the past 40 years? Office for National Statistics, 8 August 2017. Wealth in Great Britain Wave 5: 2014 to 2016, Office for National Statistics, 1 February 2018.